SONSONATE, El Salvador (CNS) — His Boston Red Sox baseball hat is almost as big a part of him as his brown Franciscan habit. Anywhere Franciscan Father Flavian Mucci goes in El Salvador, he’s known not only for his love of baseball, but more importantly, for the only thing he loves more than the game: the poor. Fifty years ago this July, Boston native Father Mucci arrived in El Salvador with one piece of luggage, much in the same way his Italian grandparents first arrived to the United States, the country where he was born. 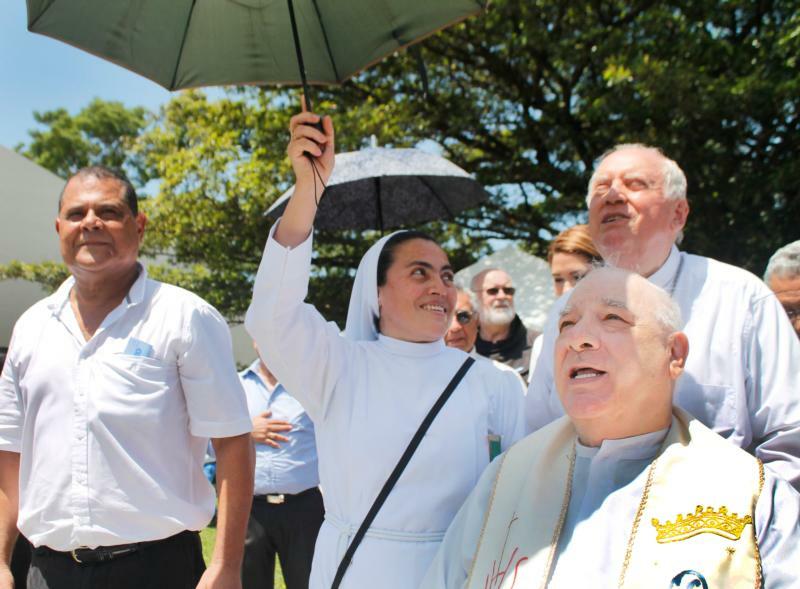 Though the U.S. is where he grew up and received his formation in the Order of Friars Minors for the Province of the Immaculate Conception in New York, “my heart, my mind, it’s all here,” said Father Mucci, referring to El Salvador, the country to which he has devoted five decades of his life. In those five decades, he’s built what amounts to an empire of social and public services called the Agape Association of El Salvador. Known in the country simply as Agape, the Greek word for love, it includes clinics, a soup kitchen, a home for the elderly, a nascent university and other educational centers for children and adults, as well as a restaurant (named after his mother), a hotel, and TV and radio stations. Through war, natural disasters, and now the rampant gang violence that plagues the country, Father Mucci has remained steadfast to his vision to serve the poor of El Salvador. As others abandoned the country because of the impending conflict, Father Mucci began feeding the poor in a rural soup kitchen in 1978, and as the country found itself in the middle of war in the mid-1980s, he built the Agape headquarters on the rural outskirts of the city of Sonsonate in the western part of El Salvador. “When I want something, I get it done,” said Father Mucci, 84. Though he’s retired from his post as head of Agape, he keeps an office on the Sonsonate campus where he sees visitors wanting to know about his life’s work. It all began in 1977 when he hosted the homeless for Christmas dinner at the parish where he was serving. What began with a soup kitchen expanded into more than 50 programs that medically treat, train, educate, feed or employ hundreds of thousands of Salvadorans who have at one point or another used Agape’s services, now in 24 locations throughout the country. Father Mucci’s vision was simple, said Franciscan Father Jack Hoak, who now runs the organization, he wanted to put into practice what the founder of the Franciscans called them to do: love the poor. When Father Mucci arrived in El Salvador on July 9, 1967, as a 32-year-old friar, there was no war, but there was rampant poverty. “It was easy for me to understand (the poor) more than any other priest because I was poor,” said Father Mucci in an April interview with Catholic News Service. Though his father had once made a good living as a mason in Boston, he became ill, died and the family went into poverty. A group of religious sisters and the Knights of Columbus helped his mother with education for the children and other necessities such as shoes, but they couldn’t save his dreams of becoming a baseball player. He beams when he talks about baseball. Looking back, Father Mucci, perhaps jokingly, said he’s still not sure what would have been better, life as a priest or as a baseball player. As a baseball player, he’d be retired by now, he said, perhaps divorced. “I think God chose this, so this must have been better,” he said, recounting the difficulties of his life as lessons and opportunities. During his formation, he recalls, when seminarians were told to go home and give away all their possessions, he had nothing to give away, “not even five cents,” so instead he used to the day to learn to drive and got his driver’s license the same day. When he arrived in El Salvador, he said he clearly understood when mothers asked for help to send their children to school because of what his mother had gone through. He knew what it meant to be hungry, what it meant to have no money. He asked to forgo vacations, other than occasional ones to visit family in the U.S., because the “poor can’t even take one vacation” he said. Instead, he devoted that time to building what has become of one of the biggest employers in El Salvador and a spiritually based empire of sorts. International organizations seeking to fund programs to help with the violence are betting on Agape, with its emphasis on education and employment, to help reduce the most dire problems the country is facing, said Father Hoak. “We’re often the ones others ask for help when it comes to programs for youth, so that they don’t fall into drugs,” and even gang prevention, said Father Hoak. When people are looking to give money to an organization that produces results, the Agape association is usually the one the players in the country recommend. For his contributions to El Salvador, Father Mucci has been given numerous awards and honors over the years. His friar’s sandals — including one with a hole in it — and his cincture, a cord, were gold-plated and now hang outside a shrine he helped build. On July 9, his many admirers in El Salvador gathered at the Agape compound in Sonsonate to mark his 50 years in the country. Father Hoak, who often finds himself toiling in the shadow of his fellow friar, said it’s not a difficult task because he understands the enormity of what Father Mucci built. While preparing a presentation on saints, he said, he began thinking about Father Mucci. Father Mucci sees it another way, however, said Father Hoak.